Waiting on Wednesday is a weekly meme hosted by Breaking the Spine. It's a way to highlight the books that have yet to be published, but hope to read when they are. I love with Jody Hedlund's writing. She writes beautifully and just brings you into the story and her attention to detail is phenomenal. I'm looking forward to reading more. 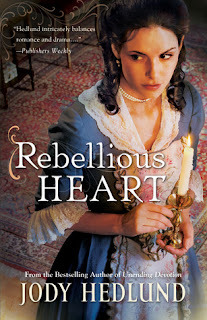 I'm looking forward to Rebellious Heart too! And all of those books with very interesting synopses, coming in 2014. As well as, Melissa Tagg's Made to last, and Dani Pettery's Strandered. Jody is one of my absolute favs, so I'm definitely counting down the days until I get my hands on this one!! Jamie, she is joining the ranks of favorite authors for me. :-) I can't wait to hear what you think of Rebellious Heart.